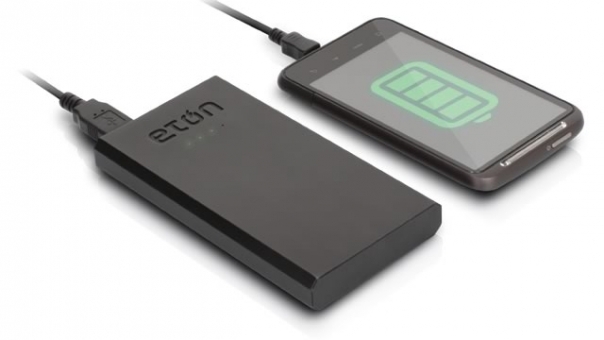 The Eton Boost8400 a backup battery pack with a high capacity 8400 mAH lithium ion battery that provides long-lasting reliable power whenever and wherever you need it. The Boost 8400 features a Micro-USB DC input to use with most smartphone chargers and two standard 2.1A USB ports so you can charge two devices (two smartphones or a smartphone and tablet) simultaneously—with a combined output current of 2.1 Amps. It has dual USB charging ports so you can charge two phones, or an iPad and a phone simultaneously. When the Boost 8400 is all charged up, it packs enough power to charge most smartphones three times and can even charge tablets. 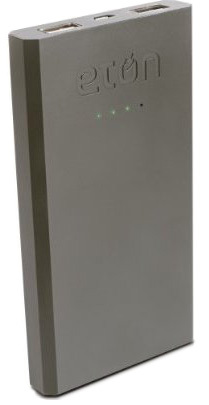 It features an integrated 6600 mAh Li-ion battery, a 4 LED charge indicator, dual standard USB outputs and micro-USB input. Supplied with micro-USB cable. An LED charge indicator lets you monitor the battery charge level when you give it a quick shake. The sleek design fits perfectly in your pocket, purse or palm for an anytime, anywhere power boost.